Perfect Cooker Review: Does it Work? Perfect Cooker is a solid product which performs generally as advertised. It is not large enough to feed a family, and it is more expensive than some popular competitors. It should prove pleasing to the majority of customers who purchase it. Perfect Cooker is an As Seen on TV cooker which can make small meals and desserts. The Perfect Cooker 3 Cup comes in a “Buy 1 Get 1” offer for $39.98 (broken into two $19.99 payments) plus $9.99 P&H for each cooker, for a total of $59.96. You can now find the Perfect 3-Cup in some stores such as Kohl’s for about $30. The Perfect Cooker 5 Cup also comes in a “Buy 1 Get 1” offer for $79.94 (broken into two $39.97 payments) plus $9.99 P&H for each cooker, for a total of $99.92. You will also have the option to add a 4-year warranty and Titan Peeler to your cart upon checkout. The TV commercial below was posted to the official Perfect Cooker YouTube channel in July 2015. Does the mealtime grind have you losing your mind? Mixing, blending, stirring, and rescuing? Introducing the Perfect Cooker. Now you can make perfect rice every time with just one touch. Brown rice, white rice, wild rice, any rice. Perfect grains, too. Oatmeal, quinoa, grits. How about pasta cooked from dry right in its own sauce? The nonstick inner pot makes cleanup a breeze, and of course it’s dishwasher safe. Perfect Cooker also makes perfect complete meals, like protein-packed turkey chili, hearty stews, and mouth-watering meatballs. Prepare homemade meatloaf in under one minute. Tasty lasagna, cooking the noodles right in the sauce. And the perfect one touch soup maker. Make noodles and oodles of Buddha Bowls. You can even cook from frozen with just the touch of a button. How does it do it? Its built-in thermal sensor calculates the exact heat and cooking time for any recipe, and when your meal is done it automatically goes into a warm mode, so it’s ready to eat when you are. How about perfect chili, an all-American classic prepped in minutes, and ready for game time? He’ll think you slaved all day. Egg-tastic breakfast with a touch of a button. Perfect omelet, perfectly hard boiled eggs, and breakfast sandwiches. Great for seafood, rice bowls, lasagna, pulled pork, burrito bowls, and more. What about desserts? A brownie volcano prepped in minutes with the touch of a button. Make apple crumble, banana bread, birthday cakes, even perfectly-made cheesecake. Make it and now take it. Perfect Cooker is portable. Now you can enjoy home cooked meals anywhere. RVs, boats, tailgate parties, and sporting events. The possibilities are endless. And office workers are raving about it because they can make meals right at their desk. No more standing in line at the microwave or expensive lunches out. And look, its compact design takes up less than a coffee machine. It easily stores away in seconds in any cupboard or desk drawer. Order now. Make mealtime perfectly easy and perfectly delicious with the Perfect Cooker. 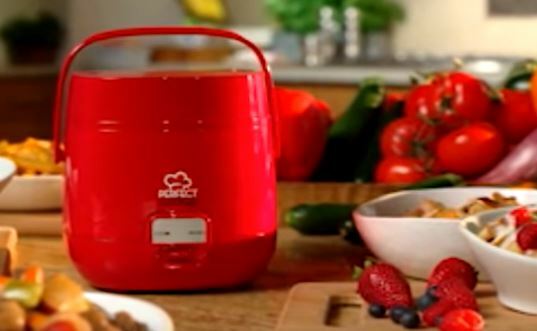 Perfect Cooker is an As Seen on TV cooking appliance which is advertised as a portable and compact way to create meals. It features an inner non-stick pot which can be washed easily. The outside of the unit is cool to touch. With Perfect Cooker, you can warm up food or cook small meals, which will be kept hot automatically. Perfect Cooker is a small unit, which is mostly likely going to make enough food for one person in most cases. It warms up food based on a “thermo sensor” which calculates cooking time. It will automatically enter warming mode to keep food at a proper temperature until it’s ready to be eaten. This is an excellent choice for dorms, offices, and RV’s – places where only one or two people may need food prepared. It won’t feed a large family, however. A 5-cup capacity model has since been added, which may alleviate complaints about its small size. Perfect Cooker started appearing in stores in early 2016. This will allow you a chance to evaluate it in person to see if the size is appropriate for your needs. Perfect Cooker is similar to the Crock Pot Lunch Crock Food Warmer, which has similar features and is rather highly-rated from customers on Amazon. That product only runs about $20. Perfect Cooker is a solid product which performs generally as advertised. The 3-cup model is not large enough to feed a family, and it is more expensive than some popular competitors. It should prove pleasing to the majority of customers who purchase it. Now that it is available in stores, you can evaluate the size as well as avoiding shipping costs and delays. Have you tried Perfect Cooker? Please give it a star rating and comment below. The pricing is wrong. Do a search for it and you can get two for $50 including shipping. Cooks scrambled eggs perfectly. Only 200 watts. Great size for my foldaway table. Can't keep it on "cook " when it wants to stay on "warm ". No way to keep the button down. Outside gets a little warm for transportation in my back pack. Maybe if I wrap it in towels. I like it a lot more than the one by crock pot. It is hotter, which I feel is safer for food. no electronics to fail as it is a total thermal magnetic device and is not that smart. it is not a smart cooker,it has no electronics inside. 4 works with a thermal magnetic switch and a hold thermostat combined with a sealed heating element Cost $5 in parts. Can u cook from frozen? Price, for 2 cookers, 2 payments of $19.99 + p & h. FYI postage & handling is 2 charges, 1 for each unit. About $60. Per unit total. Excellent price! You can pick one up or purchase one online at BED, BATH & BEYOND for $29.99. So returns or exchanges would be easy if you aren’t happy. Correct the average price per unit including the postage and handling is $30. Which is a great price for something that could make having a hot lunch at work easier. WHERE DO I GET THE CUP 5’S”” OF THE PERFECTCOOKER. Please do not waste your money on purchasing the so call Perfect Cooker, they don’t tell you on the commercial that you have to flip the meatloaf over when cooking, and that you may have to cook it more than one time between cool down period. I would be afraid of food poison with this type of cooking., they tell you it’s free S & H but if you return it they charge you for S&H and you have to pay to return it to them so you invest about $30 just to check it out, when it may be worth $10 for the cooker itself.